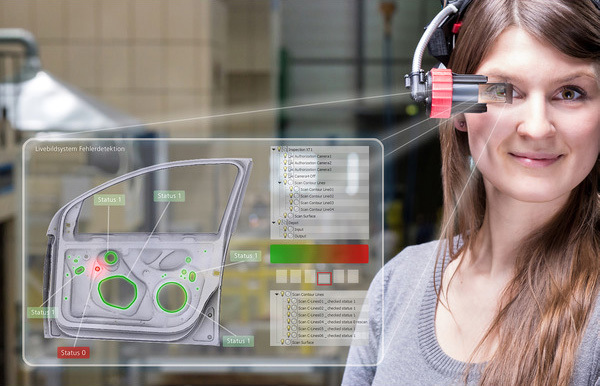 Fraunhofer’s Presswerk 4.0 project employs targeted data networking in manufacturing to help employees recognize and correct failures more quickly – and reduce failure-related downtimes by at least half. Smart, connected machines balance out disturbances so that material that normally lands in the scrap pile can be processed. Researchers at the Fraunhofer Institute for Machine Tools and Forming Technology IWU have made it their mission to develop Industry 4.0 in the field of mechanical engineering. One of their areas of focus is the press shop of the future. “We combine the various streams of data in our Linked Factory, a data and service platform developed here at the institute. From that, we generate new information that we can provide to staff, for example on mobile devices,” explains Sören Scheffler, a scientist at Fraunhofer IWU. “On the basis of this data, researchers are able to isolate the cause of a failure more quickly and make targeted suggestions to staff as to how to rectify it as quickly as possible.” Together with partners from industry and science, Fraunhofer IWU is working on reducing failure-related downtimes by around 50 percent. However, Presswerk 4.0 is set to not only tap potential related to downtimes. The aim is also to help operators react more quickly and flexibly to market needs and customer preferences, even when plans change at short notice. The researchers’ first step is to build on data that is already being collected – by sensors or camera systems, for instance. Often these are insufficient for the position where they are connected. In the future, a software application will collect this data centrally, associate it with the other information, and thus generate new knowledge. In the case of the faulty door, for example, it will merge data from the sensors in machine tools with information about lubrication and data on the raw material used; then it will check which values lie outside the pre-defined tolerance limits in each case. On the basis of these results, staff will receive suggestions for troubleshooting options to enable them to solve the reported problem in a targeted way. In the long term, researchers want to develop the system further to the point where it can issue a warning even before a fault has arisen. In order to achieve this, additional data sources are installed in the form of sensors. “For instance, we could examine the material before it goes into production. Is a given sheet in good shape? If not, the employee can discard it before it is formed and other components are mounted onto it. In this way, resources are saved because we don’t have to throw away the entire assembly,” explains Scheffler. The IWU researchers are taking it a step further: with a combination of process sensors and active components, it is possible to optimize the forming process window. “If I provided the press with this newly collected information about the nature of the raw material, it could then carry out appropriate measures to compensate and balance out disturbances, for instance by using active components such as smart guide shoes or adaptive warehousing. That means I can process raw materials that normally would have landed in the waste container,” says Scheffler. Fraunhofer researchers will be presenting Presswork 4.0 at Hannover Messe, taking place from April 25-29, 2016 (Hall 2, Booth C16/C22). The overarching theme of this year’s Hannover Messe is “Making industry 4.0 visible.” Visitors can experience a miniature press shop model, which also serves as a projection surface. By holding up a tablet computer in front of the model, they will see virtual information about the real model. “In this way, we can visualize the stream of information that otherwise remains hidden – in other words, we make Industry 4.0 visible,” says Scheffler. 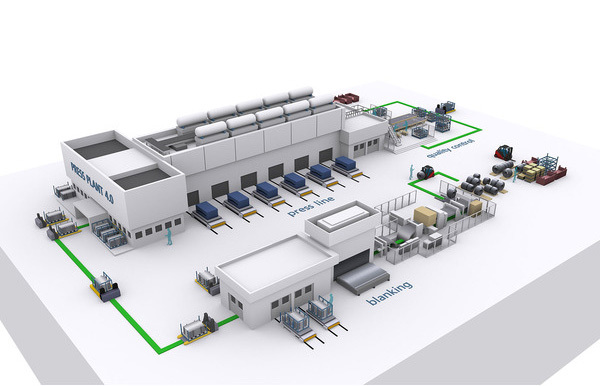 Visitors can take a virtual tour of the various scenarios and see how Industry 4.0 technologies can be used to save energy, material and time.